Long Term Care for seniors is our passion. Heritage Villa in Bartlesville provides both long term traditional nursing home care as well as short-term skilled nursing rehabilitation care that may last just a few weeks. We treat each patient as an individual, creating a customized care plan that meets his or her needs to contribute to a greater quality of life. We strive each day to be the nursing home of choice in our community, and the caliber of service that we offer reflects that in every area whether it is nursing, dining, or even our cleaning crew. Our medical staff can provide a number of complex medical services for residents including pain and wound management, diabetic or dialysis care, respiratory services, and IV therapies and antibiotics. We are trained for any situation that may arise, and make it our personal goal to keep residents safe and well cared for to the best of our ability. Experts at transitioning seniors from hospitals to rehab to home. We know that transition can be one of the most difficult stages in the process of caring for seniors. Managing the coordination of medicines or the very specific care your loved one needs is where we come in. At Heritage Villa we work with the primary care giver to make sure there are no unresolved issues and that any care need, no matter how complex, will be met. Our goal is to have a comprehensive set of knowledge about the patient’s condition and treatment when leaving the hospital and making sure that it transfers to our healthcare setting. We promise our staff will always be active participants in the process of transition. There are scenarios when a senior needs to be readmitted to the hospital. We want to eliminate as much “go-between” as possible for our residents. 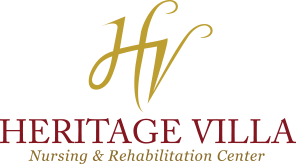 Taking a rehabilitating resident, or even a long-term resident to the hospital is a last resort measure at Heritage Villa. We want to do everything within our power medically to help each resident maintain consistency in his or her living situation, and to make sure that patients are receiving the best post-hospital care. Our staff makes sure each individual is cared for in a way that facilitates a smooth, full recovery so they can return home. We also want to make sure that seniors can perform daily tasks on their own before they leave. © Copyright 2019 Heritage Villa Nursing & Rehabilitation Center. All Rights Reserved.